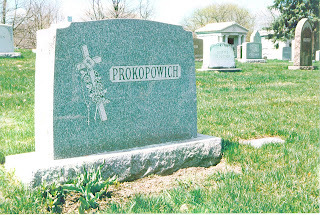 A family plot at Notre Dame Cemetery, Worcester, is the final resting place of Julius and Anna Prokopowicz and several of their descendants. Their youngest child, Annie, age 5, died from injuries sustained in a tragic traffic accident in July 1940. 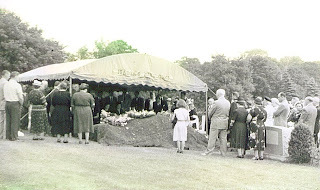 When Julius passed away suddenly in July 1951, Annie's remains were moved to join his in St. Theresa's Section, Lot 168, pictured here. 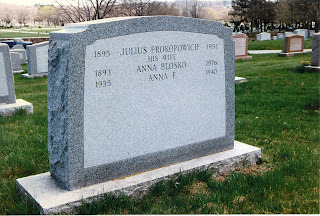 Anna was buried here in 1976, and son Julius in 1998. Another marker notes the loss of son Lucien in 1982. Son Alphonse, who died in 1989, and other family members have niches in the cemetery's mausoleum. Also pictured are family, friends, and other mourners attending Julius's burial services, which were arranged by the Isador S. Mikoloski funeral home. Our respective families from Worcester seem to have interacted with each other quite a bit! 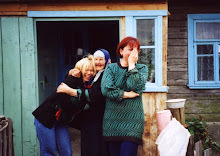 One of my cousins married a Mikoloski! Steve, we are all connected here, there's no doubt about it. I've often wondered what happened to the Mikoloski funeral home records when the business closed (sometime between 1955 and 1970). You may be well positioned to inquire!